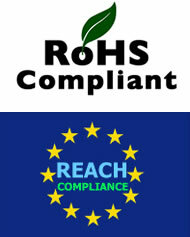 Seguridad RoHS - REACh | Comercial Levantina de Curtidos S.L. Registration – Chemical producers are obliged to register safety data for all chemicals produced in quantities above one ton a year to a central agency. Less information is required the lower the tonnage of chemicals produced per year, with only very basic information required for 1-10 tons. Evaluation – Experts from Member states and the European Agency will evaluate safety data for higher volume chemicals and other chemicals of concern. of similar concern, e.g. endocrine disrupters.